The three largest ebook companies all have shiny new color ereaders that double as tablets ready just in time for the holiday season, with all of them trying to duplicate the success of the Nook Color from last year. 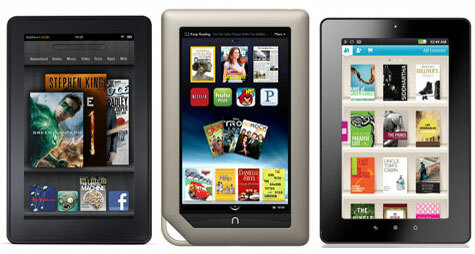 Comparing the specs of the Nook Tablet versus the Kindle Fire and Kobo Vox reveals all three are very similar devices. They all run Android and have the same size screen and share the same general characteristics for reading ebooks, watching videos, listening to music, browsing the web, email, and plenty more. It’s a tough comparison for the Kobo Vox because the Kindle Fire and Nook Tablet both have faster processors, but neither are available outside the US so the Kobo wins in that department. The Vox also has the advantage in that it is running an open Android 2.3 whereas the other two are restricted to their respective appstores. The Kindle Fire’s main advantage is the tie-in with all of Amazon’s digital content for Android apps, music, videos, and ebooks, with free cloud storage for all Amazon content. Amazon Prime members also get free ebooks and video streaming. The main disadvantage of the Kindle Fire is the meager memory and lack of a memory card slot. Amazon is going all in with cloud storage. The Nook Tablet has the advantage with twice as much RAM and storage space. It can house up to 48GB with a microSD card. That’s just insane compared to the Kindle Fire. The Nook has an active hacking community as well, with custom ROMs that can turn it into a full-fledged tablet. The Nook’s main disadvantage it that the Nook appstore is more limited and some apps cost more than at other stores. Keep in mind this Nook Tablet vs Kindle Fire vs Kobo Vox comparison review is a preliminary comparison. I’ll post much more detailed hands-on comparisons and video reviews once I have the devices in hand. Subscribe to keep updated. There’s also this earlier post comparing the Kindle Fire vs Nook Color. Note: You can sub out the Nook Color for the Nook Tablet in this comparison as well (there wasn’t enough room in the table). These are the only differences with the Nook Color: It has an 800MHz processor; it runs Android 2.2; it has 8GB internal memory and 512MB RAM; 7-8 hour battery life; and weighs 1.7 ounces more than the Nook Tablet. B&N insinuate the screen is better on the Nook Tablet in some way but the specs are identical so it’ll have to wait for in-person testing. Size 7.5″ x 4.7″ x 0.45″ 8.1" x 5" x 0.48" 7.6" x 5" x 0.53"
Is there any chance of you posting a screen comparison of the aforementioned devices before Black Friday? I’m not referring to a full review, merely a look at the screens’ respective viewing angles, glare, ppi, text sharpness and so on? This is just to fill the void when waiting for a TRUE color eReader. eInk announced their Triton color screen more than 1 year ago now and nobody is able to embed one for a (U.S. distributed) eReader? As for the alternative, a second gen Mirasol display. The Adam Notion Ink 2nd gen is about to be released I think, from India. U.S.A. is not anymore what it used to be in high tech innovation. Great comparison table! Thanks for putting it together. 2) Will the Kindle Fire read epubs? So far it doesn’t look like any have USB hosting capabilities unfortunately. The Kindle won’t support EPUB directly but it will through Android apps. Amazon have Aldiko in their store and Kobo too. I highly doubt that Amazon would remove those apps for the Kindle Fire. We’ll know for sure next week. On paper all three devices seem to have what they need for their intended use. I look forward to your hands-on reviews to see how well they actually perform. I’m wondering how the big three (Kindle, Nook, Kobo) will compare to the $199 Lenovo IdeaPad A1 with its 2 cameras, 16GB, and GPS. I too would like to see a screen comparison please. I am inclined to buy the Kindle Fire for my kid but I will wait for some more info on this blog. Great blog. The mic should be listed as a separate entry in the table so that it stands out. A rooted nook tablet should be able to make phone calls using sykes. Was wondering if the color e-readers can be adjusted so that the screen is easier on the eyes when doing a lot of reading in one sitting? Yes, the brightness can be adjusted as well as the background color for most apps. The writer missed one point about the Nook Tablet. He was right in saying that it has an active hacking community. He failed to mention that B&N includes instructions (albeit not very good ones) on how to root the nook so as to turn it into a full fledged tablet. Once you do that, the nook is no longer limited by the B&N app store. Instead it has full access to the entire Google Market, which happens to also include the Nook app, as well as the Kindle and Kobo apps. Combine that with the better hardware specs and there is no real reason to buy the Kindle or the Kobo. I don’t know where you are getting your information. B&N does not provide instructions on how to root any of their Nook devices, never has never will. But you can find all that information here on this website. Hello Nathan, Thanx for your comparison chart. I currently have a Kindle (2nd Gen) but it is old and is losing its clarity. I love the idea of getting one of these tablets, but I need the Text to Speech function to read books (I have a long commute). Do any of these (kindle fire, Nook Tablet, Kobo) have the Text to Speech function for reading books? Everything I read seems to contradict and I would really like to know. Thanks! No, they don’t have text-to-speech directly. Certain apps have TTS, it just depends. Press Reader has really good voices for reading newspapers. The ebook apps I know of don’t support DRM’d ebooks, though. You’re probably better off with a Kindle because of the long battery life. If you have a long commute you’d probably have to re-charge a tablet everyday. You may consider just upgrading your Kindle. The Kindle Keyboard and Kindle Touch both have TTS and start at $99. Thanks Nathan. I am looking for a tablet that is in color, can play movies, and has the text to speech function to read e books. Does such a device exist? That depends on where you want to get your books. The ebook apps I know of that support text-to-speech don’t support DRM so only public domain and non-DRM books will work, leaving most books out unless you strip the DRM. One exception is the Asus Transformer, which is my favorite 10″ tablet. ASUS put a custom app on it that has text-to-speech and supports Adobe DRM. There may be other exceptions I don’t know about. The Augen eReader did TTS too but it wasn’t very good. You might consider audiobooks. The reading is a lot more enjoyable because the voice actors are generally really good. I took your advice & purchased the Asus tf 101. It seems pretty amazing but i feel so lost. I have searchedthe Asus website for a tutorial and can’t find one there or online. Is there a resource i can use somewhere to learn how to use it? I.E. I cant get netflix to work (it says i’m supposed to enter a device # i cant find) if u can point me in the right direction i would appreciate it. I know what you mean; there’s a lot to learn. If you run a search for Honeycomb tutorial you should turn up something good. The OS is mostly the same as other Honeycomb tablets. There’s also the Asus Campus blog that has a few tutorials, like setting it up to use your Windows computer and how to use the SuperNote app. Netflix works fine on mine; I’ve never had to enter anything but my login info. Perhaps uninstalling and then reinstalling will get it up and running.